"Rick Smith brings a fine woodworker's grace and a scientist's mind to the design of his hammers. At last, someone is building a flexible, precision hammer worthy of the music we intend to play." "My long hammer quest is over. Rick Smith dulcimer hammers are my standard now. I know of no other dulcimer hammers currently available in the market that equal the high caliber of workmanship, playing qualities and price found in Rick Smith hammers." Your dulcimer is a work of art. Shouldn't your hammers also be objects of artistic beauty? 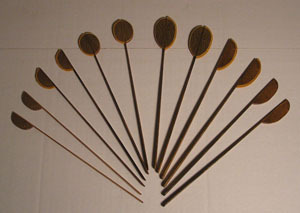 Firewood Treasures makes carefully crafted, flexible shaft dulcimer hammers. Because of their light weight and responsiveness, "Flexibles†" are the choice of many professionals. Our hammers are custom-built and are available in a variety of styles (single- and double-headed) and sizes (large and small). The small are ideal for standard spinet hammered dulcimers. The large are designed for concert grand hammered dulcimers. Handles are made from black cherry*. Because we adjust our hammers for flex, there will be no significant difference, if you order a set years from now. So, keep your tag, which specifies weight and flex. Handle length is 9 1/2". The wood in the head varies with style. Single headed hammers have spalted dogwood** heads (very slightly heavier than hard maple). Double headed hammers use lighter weight wood, selected to be virtually the same overall weight as their single-headed dogwood cousins! Highly figured woods, like cherry, spalted English walnut and dogwood, lend a special uniqueness and beauty to these flexible dulcimer hammers. Heads are either bare wood or covered in leather. Leathers can be chosen from thin and hard, to thick and soft. And the soft leather can be mounted with either the smooth (soft) or rough side (very soft) exposed. Suede-side-out will give you the softest, most muted tones. Depending upon availability, color of leather may vary from that shown (all will be tan to brown earth tone). All of our dulcimer hammers are matte finished with 3 coats of traditional, hand-rubbed tung oil varnish. This finish soaks in, so you get the feel of the natural wood, not that of plastic. Oil varnish finishes are highly durable, and easily restored if scratched. A light coat of hard paste wax can be added by the user, if extra sheen is desired. We can also recover your old hammers - see below. Most commonly selected syles are in stock; however, a set can be custom-made*** to your specifications. Click on the appropriate "Add to Cart" button below for the general style. After you complete your payment, send us an email specifying the woods and leather you want. When you receive your hammers, they will come with a tag recording their weight and flex. Keep this tag in case you want to order another matching (or somewhat different) pair in the future. Check criteria at bottom of this page to aid in selecting the head size appropriate for your dulcimer. For example: For a small double-headed hammer with one side covered in hard leather, the other in soft leather with smooth side out. We can also custom make a pair of hammers for you. Examples might be a different width (standard is 3/8") or length (standard is 9 1/2") handles, or heavier or lighter weight heads. The additional charge for such special requests is 20%, and please allow 2 weeks for building your hammers from scratch. Email us, and we can discuss your needs. Eventually the leather on your hammers will wear out. We can professionally recover your hammers using the same leathers we use on our own hammers. Just click on the appropriate link below, send us an email describing what repairs you desire, and then mail them off to us (insurance would be prudent). Aside from shipping time, we can generally complete the repair in 1-2 days. The price for recovering large and small headed hammers is the same. † Master dulcimer maker David Fletcher calls these "contra hammers." * Firewood Treasures never stains its woods. So, our black cherry heartwood hammers start out light in color, and will develop the rich deep patina characteristic of cherry over time. ** Our spalted dogwood has a very unique streaked/spotted pattern. *** If your design happens to be out of stock, allow 1 week for assembly and delivery of custom-designed hammers. For a small surcharge, we can also build a set to your specifications of wood, size, weight, and flexibility. Use our Contact Us link to discuss your needs. ° These "second item" buttons are included so that you don't get charged twice for shipping. So, for orders for more than one set of hammers of any type, use the appropriate "second item" buttons for all items (or repairs) beyond the first.